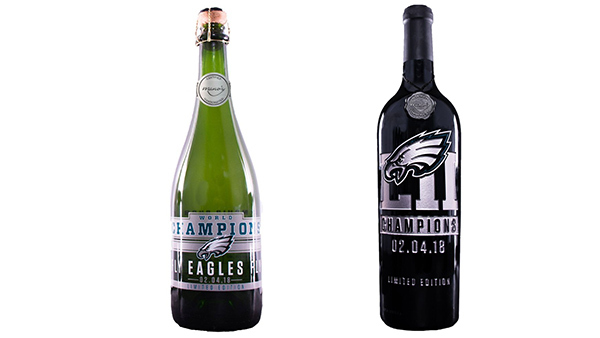 You can toast the Super Bowl Champion Philadelphia Eagles with their very own wine. In honor of the team's first world championship, the team has launched "Championship Red." The Eagles and Mano's Wine have come together for this limited edition Central Coast Cabernet Sauvignon and Monterey Merlot handcrafted reserve. The Eagles say the blend has been aged for 15 months in a combination of French and American Oak barrels. There is also a "Championship Bubbly." Either way, Eagles fans can enjoy the "taste of victory" in a whole new way. "Championship Red" and "Championship Bubbly" can be purchased online now at www.ManosWine.com and will be coming soon to Fine Wine and Good Spirits, grocery stores and local wine retailers in the Philadelphia area.